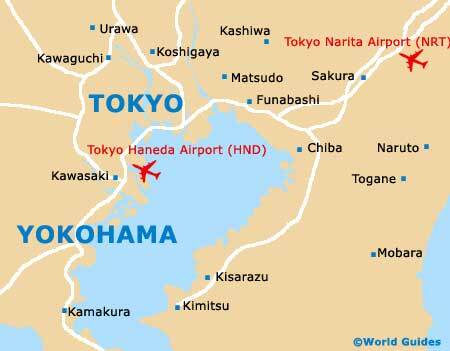 In 2004, Narita International was officially renamed after the suburb where it is situated, to the far north-east of Tokyo, to avoid confusion with the capital's other major air hub, Tokyo International (Haneda Airport). Of note, Tokyo International Airport is the only Japanese air facility with more passenger traffic than Narita International Airport, being where most of the city's international visitors arrive. Roughly 35 million passengers navigate the two busy terminals each year. Although passengers cannot walk between the two terminals, they can board a shuttle bus. A central building stands between the North and South wings of Terminal 1. The South Wing is reserved for Star Alliance carriers, while most North Wing flights are SkyTeam carriers. Japan's first cable-operated people mover travels between the main building and the satellite buildings of Terminal 2, where domestic flights operate alongside most Japan Airlines flights. This airport also serves as the primary international hub for both Nippon Cargo Airlines and All Nippon Airways. Narita International Airport stands less than 7 km / 5 miles south-east of Narita Station and 65 km / 40 miles north-east of central Tokyo. The travel time between Narita and central Tokyo decreased by 20 minutes after the 2010 Narita Rapid Railway opening. Drivers wishing to brave the capital's traffic can easily hire a car and drive along the Higashi-Kanto and Shuto expressways from the airport to central Tokyo. 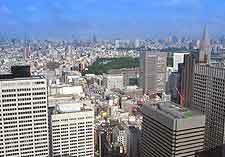 Driving is more convenient for suburban travel, as parking is scarce and toll roads are expensive in central Tokyo. The airport also operates taxis with fairly pricey fixed rates. Airport limousine buses take just under an hour to reach central Tokyo from Narita International Airport, stopping at several suburbs and hotels along the way. Although buses travel more slowly than trains, first-time visitors may prefer bus travel, since buses conveniently drop passengers off directly in front of their hotels and each of the Departures areas. Passengers can also take overnight buses to Osaka or Kyoto. There is no shortage of rail connections between the airport, Tokyo and the rest of Japan. Each terminal has its own lower level rail station and passengers can book seats on Narita Express trains at each terminal's NEX rail counter. Narita Express trains depart every half hour and take in the region of one hour and 40 minutes to reach Tokyo Station. Passengers can also purchase tickets for the slightly faster JR (Japan Railway) trains or the Keisei Skyliner Express.